The statement came a day after a group of 30 people went public with their complaint against professor Sadanand Menon, and the college reportedly refused to take action. 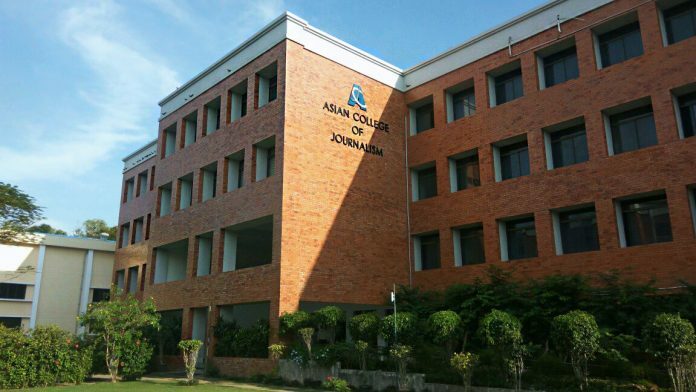 New Delhi: The chairman of the Asian College of Journalism (ACJ), the premier media school accused of not acting on complaints of sexual harassment against one of its professors, has said the institute is being targeted for being “liberal”. Menon’s name first surfaced in the list of alleged sexual harassers across Indian universities compiled by law student Raya Sarkar last year. The alleged incident took place in 2012, and involved a former student of the 2008 batch who later worked with Menon. After Sarkar’s list was released, Neerja Dasani filed an official complaint with the ACJ’s internal complaints committee. The complaint was, however, dismissed by the committee over a technicality – the panel said it could only look into matters reported within three months of the alleged assault. The committee also pointed out that the alleged incident did not take place on the college premises. A group of 30 students currently studying at the ACJ then filed a fresh complaint against the professor, which too was dismissed by the committee. While Kumar steered away from discrediting the victims’ accounts, his invocation of the college’s “liberal standing” in his defence is reminiscent of several cases of sexual harassment where the accused have alleged “Right-wing political vendetta” as the reason for being “targeted”. In 2013, when journalist Tarun Tejpal was accused of sexual assault by a female colleague, suggestions that the former Tehelka editor-in-chief was being framed by the BJP government in Goa were repeatedly made. It was witnessed more recently at Jawaharlal Nehru University, which has been hit by sexual harassment allegations in recent months. When Mahendra P. Lama, a professor at the School of International Studies, was accused of sexual harassment, Left-leaning professors and students were quick to claim he was being “targeted” by JNU’s Right-wing groups. Most academics agree that such use of ideological labels undermines the liberal cause, which has celebrated sexual autonomy and the dignity of women, said Dev Pathak, a professor of sociology at Ambedkar University Delhi. “However, it is being done by both sides,” he added. “Sexual politics has entered a phase of anarchy, and the situation is very complex. In some cases, people are actually targeted for their ideological views,” he said. However, for others, the use of political and ideological labels is ultimately a distraction. The way sexual politics is unfolding on campuses is very complex, and cannot be put in a liberal or fascist bracket, said eminent historian Urvashi Butalia. She added that it had already been established that some of the assumptions about liberal institutions being essentially liberal places were unfounded. However, she said, going forward, the focus must be on women’s agency and what can be done to strengthen it, instead of stripping her of her agency by believing that she can be appropriated by either the Left- or the Right-wing to settle political and ideological scores.